Well, I bought a bass drone bottom (imitation ivory mounts, Ni slide) made by Douglas MacPherson from Soren Larsen, for 2 reasons. One for a friend of mine who has a set of pipes, but no bass drone bottom in case he couldn’t get a replacement (same mounting) and two, because I’ve always wanted to try a baritone drone on the GHB. Well, it worked! I start up all 3 drones, turn off the baritone, then turn off the bass, then restart the baritone, then stop and start all 3 drones again and play through a March I don’t know the name of, Kalabakan which is a Reel in ‘D’, and then a Reel I don’t remember the name of off hand (something about a train or famous bridge) in ‘A’. 1950’s ABW Hendersons half-mounted with white mounts and Ni ferrules. Inside tenor drone bottom replaced with Douglas MacPherson bass drone bottom. Poly oval hole McCallum chanter. Heavily carved Chris Apps G3 chanter reed. Recorded in a carpeted bedroom with a Zoom H2 field recorder. I walk around. Normalized with Audacity. A table of different pitches obtained by changing drone pieces and reeds. * indicates the setup used in the recording above. As you can see, there are many ways to get an E. Depending on reed, drone bore diameter, etc. I haven’t included any sound quality information except for 1 instance where it sounded not so good/not smooth. It is all kind of voodoo and after doing this, I’m amazed out how lucky I got. If I were to pursue this further, I might have a bass bottom made a little longer than normal so as to maybe be able to use a bass reed to get a D baritone and a tenor reed to get an E baritone. Although, I really have no idea whether it would work well or not. 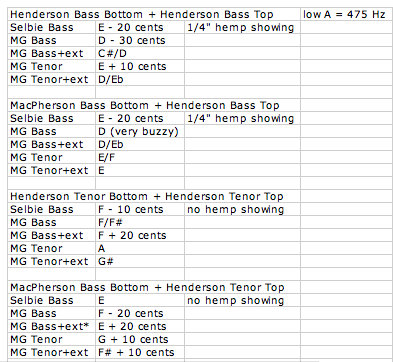 I also tried my Henderson tenor top and bottom split by a bass midsection. My Henderson bass midsection was too big, so I tried my Center 3/4 bass midsection. I don’t recall what reed I used but it is basically an alto drone. It almost pitched to D, but D 1 octave below chanter D to give an alto drone, instead of 2 octaves below to give a baritone drone. As such, splitting a tenor drone with a middle section may not work. This was all mouth blown. When a tenor reed was used, it was pretty much all the way in. When a bass reed was used in a tenor bottom, it was pretty much all the way out. But you get the idea. I have adopted a new teaching philosophy. Very simple music (relatively, anyway) to get my students playing music as soon as possible. All the embellishments are progressively added later. Here is a collection of the sheet music I start my students on. The videos may not preserve tempo as I try to emphasize grace notes, etc.